ASEAN-China ties go back a long way—China was the first country to sign a free-trade agreement with the bloc back in 2002, and it has been a dialogue partner of ASEAN’s since 1991. Now, in the face of growing protectionist sentiment across parts of the world, what may the future of this relationship look like? For several years now, ASEAN economies have been critical cogs in the regional production chains that culminate in China. But owing to various factors including, but not limited to, the rise in labor costs in China and the potential impact of the ongoing trade conflict, are we starting to see this change? BRINK Asia asks Chaipat Poonpatpibul, group head and lead economist, surveillance, at the ASEAN+3 Macroeconomic Research Office. BRINK Asia: What is the significance of China-ASEAN economic ties in the context of the ongoing trade conflict between the U.S and China? Dr. Chaipat Poonpatpibul: I’d say we have to take a look at this from two perspectives or across two time horizons. In the short term, ASEAN economies will be affected quite significantly because of the strong economic ties between them and China – the region supplies components of products to China. Industries in ASEAN that do so will be affected by the trade war once Chinese finished goods for export are subject to higher tariffs. Additionally, if the Chinese economy slows down owing to the trade war, ASEAN-based companies that export finished goods to China will also be impacted. But over the long term, we see opportunities arising for ASEAN from the trade war – we see the relocation of industries from China to ASEAN, although there is still a lot of uncertainty and it will take time for companies to adjust and to relocate manufacturing from China to ASEAN. It is quite clear, however, that a few countries, such as Vietnam, can benefit from the trade war. Vietnam is already quite ready to absorb industries looking to relocate – wages in Vietnam are still significantly lower than they are in China, and the quality of labor is good too. Even in terms of the manufacture of higher value products, Vietnam has the right labor pool for companies to transition to in the longer term. Besides, with a population of almost 100 million, it is also a large market for finished goods. It is hard to tell right now which ASEAN economies will benefit by what amount, but in general, we are quite positive about the implications over the medium term. Even Singapore, which is expensive to relocate to and is an open economy, may stand to benefit as a regional hub; we also see trade-related services in Singapore such as trade financing and logistics, benefiting from the relocation of industries from China to ASEAN. BRINK Asia: Do you see trade and investment flows between ASEAN and China receiving an impetus owing to the trade conflict between the US and China? Dr. Poonpatpibul: Even if we were to put the trade war impact aside, moving forward, trade and investment ties between ASEAN and China will grow over time because the complementarities are high. Both markets are big – China is a big market for final consumer goods from ASEAN, and likewise, ASEAN is becoming a big and important market for Chinese goods. ASEAN’s population is increasing, especially the middle class which is growing rapidly. Additionally, the fact that ASEAN has different countries at different levels of economic development is something that will support deeper trade and investment ties between the economies. Singapore is an advanced economy and a financial center; while Malaysia and Thailand are important players in the regional production network; Indonesia and the Philippines are the large markets for consumer products; and finally the CLMV countries (Cambodia, Lao PDR, Myanmar, and Vietnam) have an abundance of low cost labor – so there are clearly complementarities within ASEAN itself. With rising wages in China, we will inevitably see industries move to the CLMV countries. At the same time, ASEAN mutilnational companies will also be looking for investment opportunities in the rapidly growing Chinese market. So we believe that we will see further investments in both directions, and trade will grow as a result of the growing two-way direct investments. In addition to these factors, we expect that the trade war might be an additional catalyst for growing trade and investment ties between the two sides. Labor-intensive industries have already started moving from China to ASEAN, and we expect the trade war to catalyze the earlier relocation of these industries, and perhaps even the relocation of other industries that are affected by the trade war. .For example, there was earlier a lot of talk that China may manufacture more of the intermediate goods for processing into final goods in China, and that would have affected the manufacturing of the intermediate goods in ASEAN; but now we may see the production of final goods move to ASEAN. BRINK Asia: How important an economic driver is tourism in the relationship between the two regions/ economies? 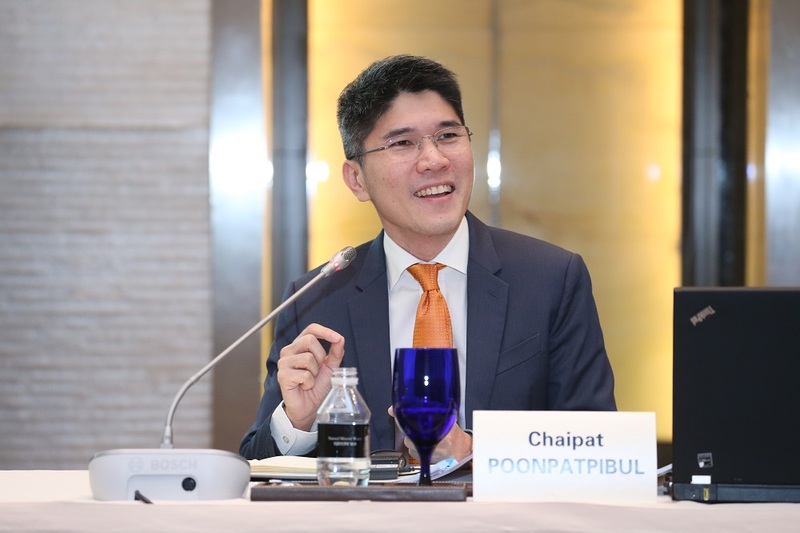 Dr. Poonpatpibul: We have seen that countries in the ASEAN region have benefited quickly and significantly because of the growing number of tourists from China. In countries such as Vietnam and Thailand, for example, the share of Chinese tourists of all tourists is currently about 25 percent. In Thailand, revenue from Chinese tourism accounted for about 3 percent of GDP in 2017, which is huge. It is clear that if a country’s tourism infrastructure is ready, Chinese tourists will come. The latest numbers suggest that the number of Chinese tourists in the region stood at 24 million in 2017. Now, that is less than 2 percent of the Chinese population, so there is still huge room for increasing the number of Chinese tourists in the region. And there is resultantly huge scope for increasing tourism-related revenue. It is about whether ASEAN countries can take in more tourists. Likewise, China can benefit from an influx of tourists from ASEAN too. In 2017, China received about 8 million tourists from ASEAN, so there is ample room for greater revenue to be had from tourism-related activity. The gain from the growth in tourism numbers is not just in terms of the increase in revenues. One important intangible is that greater people-to-people exchanges are a good way for both sides to understand each other better, in terms of culture and mindsets, which is particularly important from a business perspective. In my view, Chinese business people have started understanding the ASEAN region better. BRINK Asia: What are the key areas in which ASEAN and China should coordinate in the coming years? Dr. Poonpatpibul: The first is investment. As we see , Policies to facilitate investment will be crucial to enhance a greater flow of investments . Another area that is often talked about is connectivity. The Belt and Road Initiative (BRI) will help link China and ASEAN more closely. If this proceeds well, it will help a lot with furthering trade and investment links and overall economic integration. This assumes greater importance in the current macroeconomic context underlined by a trend of growing trade and technology protectionism. I believe that if we can strengthen physical linkages between the two sides, we will be able to thrive by relying on demand within the wider region, which is huge, especially given that this region is expected to continue seeing faster economic growth than anywhere else. BRINK Asia: In your view, is the BRI complimentary to ASEAN connectivity objectives such as the Master Plan on ASEAN Connectivity 2025, or could there be a tussle between the two? Dr. Poonpatpibul: I definitely see the two as complementary. With the BRI, things can move quickly based on funding from China after the needs and the ability to service debt over the long term have been carefully assessed.. I view that it is important for ASEAN to work as a group with China. If that can happen, then the progress will be quicker. I think, instead of looking to have these initiatives on a bilateral basis with China, it may be better for the region at large to also engage in these as a group, as that will enable the region to have good synergies between the BRI and the Master Plan on ASEAN connectivity; and it will help make infrastructure connectivity seamless.